1971 Porsche 911 2,2S Targa 180hp S-engine with mechanical fuel injection. Number matching car in great condition. This Porsche has been treated to a new correct Signal orange paint job a few years back (Original color red) and is still in nice condition with only very minor signs of use. The engine has been rebuilt by a professional garage about 10000 miles ago with all receipts available. This Porsche carries leather sportseats and lightweight doorpanels. It is also equipped with a short shift kit. Correct deep six Fuchs rims and new Bilstein shocks guarantee the superb handling those cars are known for. Targa seals are all new. Recent H4 lights installed. 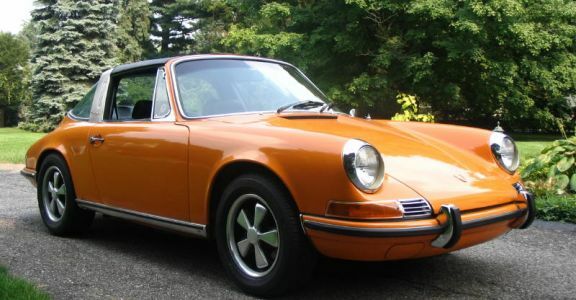 This is a rare opportunity to get one of the 788 S-Targas built in 1971 and enjoy what many enthusiasts call the best early engine of any 911, the 180hp high revving 2.2 liter S.
This car is currently still with its private owner, a 911 collector, in the US and can be inspected upon appointment.